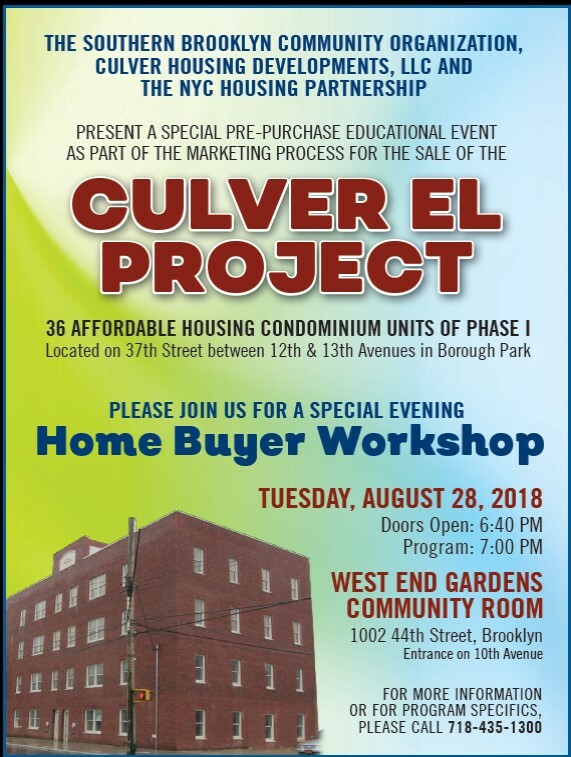 Marketing has now begun for the long-awaited Culver Affordable Housing Project on 37th Street in Borough Park. To request an application by mail, send a self-addressed envelope to SBCO c/o Culver Housing Developments, LLC, 4006 18th Avenue, Brooklyn, NY 11218. Only send ONE application per development. Do NOT submit duplicate applications. Applicants who submit more than one application will be disqualified. After the deadline, applications are selected for review through a lottery process. If yours is selected and you appear to qualify, you will be invited to an appointment to review your documents and to continue the process of determining your eligibility. Appointments are usually scheduled from 2 to 10 months after the application deadline. You will be asked to bring documents that verify your household size, identity of members of your household, and your household income. Take a stroll down 37th Street in Borough Park and you cannot help but feel the excitement in the air. Construction at the Culver project is moving along at a phenomenal pace. Nine newly built condominium buildings now grace the block – and they are quickly nearing completion. Community activists and elected officials who were involved in making the project a reality, often stop by to see for themselves the fruits of their labor. As passersby notice the nine attractive buildings, many stop to ask the contractors how they can apply to purchase one. They are typically directed to the sign displaying the number of the Southern Brooklyn Community Organization (SBCO), the non-profit community sponsor of the project. And call they do! While marketing of the project has not begun, the calls are coming from all segments of this ethnically diverse neighborhood. This has been a tremendous source of encouragement and confirms the vital need for more affordable housing in the area. As construction passes the ninety-five percent mark, we now see the end in sight and have begun making plans for the commencement of marketing. 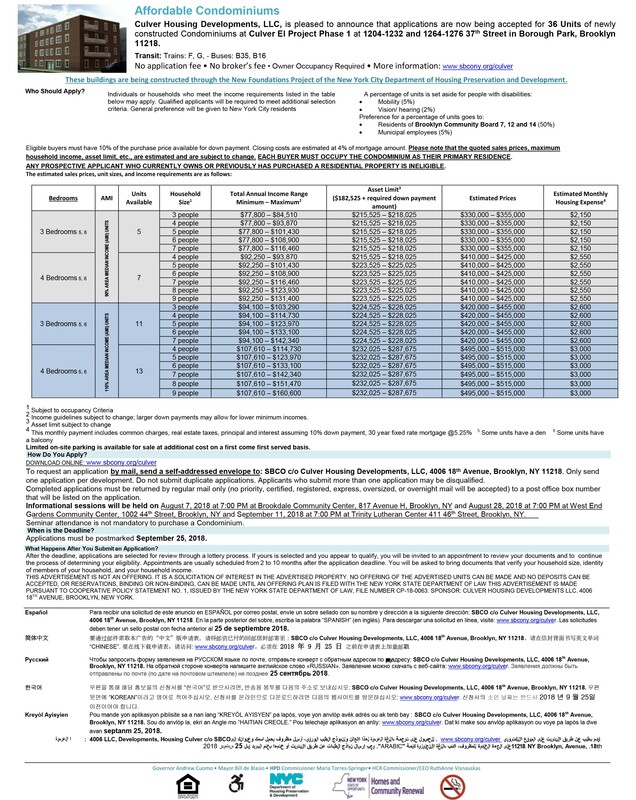 When available, applications will be mailed out to those on the inquiry list, advertised in local print media, available on the web and through calling the SBCO office. In April 2005, Mayor Michael R. Bloomberg announced plans to rezone a six-block area that will allow for the creation of several hundred new units of housing in Borough Park, Brooklyn. The re-zoning and designation of the Southern Brooklyn Community Organization (SBCO) to develop city-owned land for affordable housing, will create much-needed housing in a community where opportunities for residential development is restricted, as well as enable the expansion of one of Brooklyn's fastest growing communities. Borough Park is a community whose population has grown by 15.6% in recent years while there has only been a 4.5% increase in housing stock. The Culver Estates site was formerly a right-of-way for the discontinued elevated railway. The 50' wide strip of largely undeveloped land, running along 37th Street in Borough Park, was being used for parking and storage. In accordance with the Mayor’s housing plan, the NYC Department of City Planning (DCP) rezoned the six-block area to allow for future residential growth. In addition to the rezoning, two City-owned blocks were designated for the development of affordable housing, by SBCO. 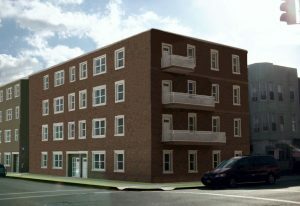 The housing project will be located on 37th Street, between 12th and 14th Avenues. The design plans call for the development of seventeen four-story structures, with one unit per floor, totaling sixty-eight units. Initially nine structures will be built on the block between 12th and 13th Avenues (Zoning Block 5295). Each building will be approximately 40' x 40', and will provide limited off-street parking spaces – part of which will be handicapped accessible. Construction of Phase I consists of nine, four-story building for a total of thirty-six three and four bedroom dwelling units - located on 37th Street between 12th and 13th Avenues is currently underway with an estimated completion date of late Summer/Fall 2018. THIS ADVERTISEMENT IS NOT AN OFFERING. IT IS A SOLICITATION OF INTEREST IN THE ADVERTISED PROPERTY. NO OFFERING OF THE ADVERTISED UNITS CAN BE MADE AND NO DEPOSITS CAN BE ACCEPTED, OR RESERVATIONS, BINDING OR NON-BINDING, CAN BE MADE UNTIL AN OFFERING PLAN IS FILED WITH THE NEW YORK STATE DEPARTMENT OF LAW THIS ADVERTISEMENT IS MADE PURSUANT TO COOPERATIVE POLICY STATEMENT NO. 1, ISSUED BY THE NEW YORK STATE DEPARTMENT OF LAW, FILE NUMBER CP-18-0063. 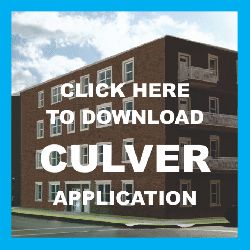 SPONSOR: CULVER HOUSING DEVELOPMENTS LLC. 4006 18TH AVENUE, BROOKLYN, NY. When will you be marketing these condos? The marketing process will begin soon. Watch local media outlets for notification of pre-purchase educational seminars and for other details. Are these apartments for rent or for sale? This project is part of the NYC New Foundations Project, a streamlined, HPD homeownership program established to develop infill sites in neighborhoods that lacked home ownership opportunities and to encourage small developers and contractors to create affordable housing. How much do I need to earn to be eligible for these units? At least one third of the units in the project must be affordable to households earning up to 80% of area median income (AMI). Additional tiers of affordability are for households earning between 80% and 110% of AMI. Are there any preferences as to who will receive these units? The project will give preference on some units to those with disabilities and to those currently residing in local neighboring Community Boards. The Community Sponsor will market the sale of these units as per a marketing plan approved by HPD. Applications will be received into a locked post-office box. Sponsor will open the lock-box in the presence of HPD and enter all applications into Housing Connect – a database controlled by HPD. Housing Connect will generate the winners of the lottery following HPD specified criteria and community preferences. Sponsor will not determine who is selected in the lottery. Please note that all duplicate applications are automatically disqualified. I am not sure I can qualify for a mortgage, is there anyone that can help me out? SBCO will be sponsoring several pre-purchase educational seminars in an effort to help members of the community determine homeownership eligibility and to begin preparing their documents necessary for securing a mortgage. SBCO’s counselors will introduce you to several mortgage products available and will give you the knowledge you need to make an informed decision. Private counseling sessions are also available by calling the SBCO office at (718) 435-1300 to schedule an appointment. I have a good job, but do not have an adequate down-payment, is any assistance available? Speak with the knowledgeable homeownership counselors at SBCO who will introduce you to the various down-payment assistance options that are available. As a HUD approved counseling agency, SBCO has access to many bank CRA (Community Reinvestment Act) products that may not be available through traditional mortgage brokers. My Bank tells me I need financial counseling, where can I get it? As part of the counseling process, SBCO’s certified counselors will provide the financial counseling required by many financial institutions.